The Royal Society for the Protection of Birds (RSPB) is a charitable organisation registered in England and Wales and in Scotland. It was founded in 1889. It works to promote conservation and protection of birds and the wider environment through public awareness campaigns, petitions and through the operation of nature reserves throughout the United Kingdom. The RSPB has over 1,300 employees, 18,000 volunteers and more than a million members (including 195,000 youth members), making it the largest wildlife conservation charity in Europe. The RSPB has many local groups and maintains 200 nature reserves. The origins of the RSPB lie with two groups of women, both formed in 1889. The Plumage League was founded by Emily Williamson at her house in Didsbury, Manchester, (now in Fletcher Moss Botanical Garden), as a protest group campaigning against the use of great crested grebe and kittiwake skins and feathers in fur clothing. The Fur, Fin and Feather Folk was founded in Croydon by Eliza Phillips, Etta Lemon, Catherine Hall and others. The groups gained in popularity and amalgamated in 1891 to form the Society for the Protection of Birds in London. The Society gained its Royal Charter in 1904. That Lady-Members shall refrain from wearing the feathers of any bird not killed for purposes of food, the ostrich only excepted. At the time of founding, the trade in plumage for use in hats was very large: in the first quarter of 1884, almost 7,000 bird-of-paradise skins were being imported to Britain, along with 400,000 birds from West India and Brazil, and 360,000 birds from East India. In 1890, the society published its first leaflet, entitled Destruction of Ornamental-Plumaged Birds, aimed at saving the egret population by informing wealthy women of the environmental damage wrought by the use of feathers in fashion. A later 1897 publication, Bird Food in Winter, aimed to address the use of berries as winter decoration and encouraged the use of synthetic berries to preserve the birds food source. 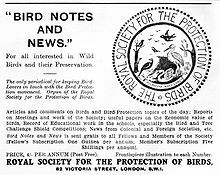 By 1898 the RSPB had 20,000 members and in 1897 alone had distributed over 16,000 letters and 50,000 leaflets. 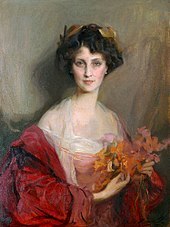 The Society attracted support from some women of high social standing who belonged to the social classes that popularised the wearing of feathered hats, including the Duchess of Portland (who became the Society's first President) and the Ranee of Sarawak. As the organisation began to attract the support of many other influential figures, both male and female, such as the ornithologist Professor Alfred Newton, it gained in popularity and attracted many new members. The society received a Royal Charter in 1904 from Edward VII, just 15 years after its founding, and was instrumental in petitioning the Parliament of the United Kingdom to introduce laws banning the use of plumage in clothing. At the time that the Society was founded in Britain, similar societies were also founded in other European countries.[which?] In 1961, the society acquired The Lodge in Sandy, Bedfordshire as its new headquarters. 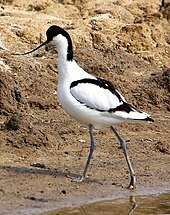 The RSPB's logo depicts an Avocet. The first version was designed by Robert Gillmor. An Avocet at the RSPB's Minsmere reserve. This species is used in the RSPB's logo. Today, the RSPB works with both the civil service and the Government to advise Government policies on conservation and environmentalism. It is one of several organisations that determine the official conservation status list for all birds found in the UK. The RSPB does not run bird hospitals nor offer animal rescue services. 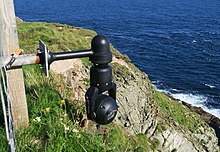 A webcam installed near Sumburgh Head lighthouse, (Shetland). 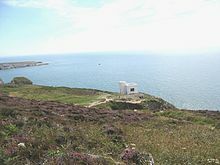 The cliffs are home to large numbers of seabirds and the area is an RSPB nature reserve. The RSPB maintains over 200 reserves throughout the United Kingdom, covering a wide range of habitats, from estuaries and mudflats to forests and urban habitats. The reserves often have bird hides provided for birdwatchers and many provide visitor centres, which include information about the wildlife that can be seen there. The RSPB confers awards, including the President's Award, for volunteers who make a notable contribution to the work of the society. The RSPB Medal is the Society's most prestigious award. It is presented to an individual in recognition of wild bird protection and countryside conservation. It is usually awarded annually to one or occasionally two people. The RSPB has published a members-only magazine for over a century. Advert for Bird Notes and News from the March 1934 edition of North Western Naturalist magazine. Note early logo. 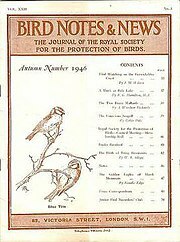 Bird Notes and News (ISSN 0406-3392) was first published in April 1903. The title changed to Bird Notes in 1947. In the 1950s, there were four copies per year (one for each season, published on the 1st of each third month, March, June, September and December). Each volume covered two years, spread over three calendar years. For example, volume XXV (25), number one was dated Winter 1951, and number eight in the same volume was dated Autumn 1953. From the mid-1950s, many of the covers were by Charles Tunnicliffe. Two of the originals are on long-term loan to the Tunnicliffe gallery at Oriel Ynys Môn, but in 1995 the RSPB sold 114 at a Sotheby's auction, raising £210,000, the most expensive being a picture of a partridge which sold for £6,440. From January 1964 (vol. 31, no. 1), publication increased to six per year, (issued in the odd-numbered months, January, March and so on, but dated "January–February", "March–April", etc.). Volumes again covered two years, so vol. 30, covering 1962–63, therefore included nine issues, ending with the "Winter 1963–64" edition instead of eight. The final edition, vol. 31 no. 12, was published in late 1965. Bird Notes' successor Birds (ISSN 1367-983X) replaced it immediately, with volume 1, number 1 being the January–February 1966 edition. Issues were published quarterly, numbered so that a new volume started every other year. The Autumn 2013 edition, dated August–October 2013, being vol. 25 no. 7, was the last. In Winter 2013 Birds was replaced by a new magazine, Nature's Home. The editor was Mark Ward. The magazine had an ABC-certified circulation of 600,885. The RSPB has two separate groups for children and teenagers: Wildlife Explorers (founded in 1943 as the Junior Bird Recorders' Club; from 1965–2000 the Young Ornithologists Club or YOC) and RSPB Phoenix. Wildlife Explorers is targeted at children aged between 8 and 12, although it also has some younger members, and has two different magazines: Wild Times for the under 8s and Bird Life for those over 8. RSPB Phoenix is aimed at teenagers, and produces Wingbeat magazine, although members also receive Bird Life magazine. 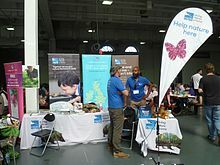 The RSPB is a member of The National Council for Voluntary Youth Services. RSPB organises bird record data collection in annual collective birdwatching days in Britain. RSPB claims this is the "world's biggest wildlife survey" and helps that society to get a better knowledge on bird population trends in Britain. That activity was launched in 1979 as an activity for kids, although from 2001 is a survey open to adults too. In 2011 over 600,000 people took part, being only 37% RSPB's members. The usual date for this birdwatching collective activity is the January's last weekend. From the start of this annual survey records for sparrows show a decline of 60%, while starling population's decline is about 80% from 1979 to 2012. BirdTrack is an online citizen science website, operated by the British Trust for Ornithology (BTO) on behalf of a partnership of the BTO, the RSPB, BirdWatch Ireland, the Scottish Ornithologists' Club and the Welsh Ornithological Society (Welsh: Cymdeithas Adaryddol Cymru). Fund-raising at the Great British Beer Festival 2016. The RSPB is funded primarily by its members; in 2006, over 50% of the society's £88 million income came from subscriptions, donations and legacies, worth a total of £53.669 million. As a registered charity, the organisation is entitled to gift aid worth an extra £0.28 on every £1.00 donated by income tax payers. It also receives contractual payments from clean energy utilities and financiers of renewable energy solutions, when its members sign up as clients. The bulk of the income (£63.757 million in 2006) is spent on conservation projects, maintenance of the reserves and on education projects, with the rest going on fundraising efforts and reducing the pension deficit, worth £19.8 million in 2006. It was reported in an article in The Daily Mail on 2 November 2014 that claims that the charity "was spending 90 per cent of its income on conservation" by the UK Advertising Standards Authority were incorrect. The article claimed that the true figure was closer to 26%. The Charity Commission investigated the claims, and contacted the RSPB to get it to clarify its web statement. The RSPB complied, with the clarification that 90% of its net income (after expenses, not gross income as received) was spent on conservation, and that conservation activities were diverse, not limited to spending on its own nature reserves. This was accepted by the Charity Commission. Over time, the organisation's chief officers have been given different titles. The RSPB is a member of Wildlife and Countryside Link. The RSPB is the UK Partner of BirdLife International and manages the South Atlantic Invasive Species Project on behalf of the partner governments. ^ a b c d e f g RSPB Annual Report Archived 28 November 2007 at the Wayback Machine, 2005–2006. Retrieved 19 February 2007. ^ Charity Commission. 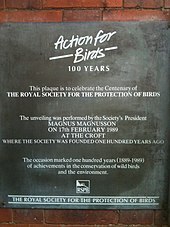 Royal Society for the Protection of Birds, registered charity no. 207076. ^ "Royal Society for the Protection of Birds, Registered Charity no. SC037654". Office of the Scottish Charity Regulator. ^ "What does the RSPB do?". RSPB. Archived from the original on 2 January 2007. Retrieved 19 February 2007. ^ "About the RSPB". RSPB. Retrieved 19 February 2007. ^ a b "Reserves & events". RSPB. Retrieved 13 February 2010. ^ Penna (1999), p. 99. ^ a b c d e "Milestones". RSPB. Retrieved 19 February 2007. ^ a b c "A history of the RSPB, from its humble beginnings, to the thriving far-reaching organisation it is today". Royal Society for the Protection of Birds. Retrieved 13 February 2017. ^ "Charter and Statutes". RSPB. Retrieved 3 February 2016. ^ "Five women who founded the RSPB - Natures Home magazine uncovered - Our work - The RSPB Community". ww2.rspb.org.uk. Retrieved 2018-07-30. ^ Adams (2004), p. 189. ^ Phillips, Eliza (1890). "Destruction of Ornamental-Plumaged Birds". ^ Phillips, Eliza (1897). "Bird Food in Winter". ^ Jonathan Burt. "Phillips [née Barron], Eliza [known as Mrs Edward Phillips] (1822/3–1916)". Oxford Dictionary of National Biography. Retrieved 19 October 2012. ^ Boardman (2006), p. 36. ^ " ". Springwatch. Season 2018. Episode 5. 4 June 2018. BBC Television. Retrieved 4 June 2018. ^ "Working Together: Government". RSPB. Archived from the original on 3 January 2007. Retrieved 19 February 2007. ^ "Frequently asked questions". RSPB. Retrieved 19 October 2017. ^ "Reserves by habitat". RSPB. Archived from the original on 20 February 2007. Retrieved 20 February 2007. ^ "Frequently Asked Questions". RSPB. Archived from the original on 20 February 2007. Retrieved 20 February 2007. ^ Reynolds, James (23 August 2007). "Gifted naturalist is awarded prestigious RSPB medal". RSPB. Retrieved 10 October 2011. ^ Ward, Mark (Autumn 2013). "Introducing your new magazine, Nature's Voice". Birds. 25 (7). ISSN 1367-983X. ^ Ward, Mark (30 September 2013). "Nature's Home is coming..." RSPB. Retrieved 15 October 2013. ^ "About youth groups". RSPB. Archived from the original on 27 September 2007. Retrieved 20 February 2007. ^ "Gift Membership". RSPB. Retrieved 20 February 2007. ^ "Full list of NCVYS members". Ncvys.org.uk. Archived from the original on 12 May 2013. Retrieved 31 January 2014. ^ a b Birds. Spring 2013 vol. 25, nº5. February – April 2013. page 18. ^ "BirdTrack partners". British Trust for Ornithology. Retrieved 25 April 2016. ^ "Bird Track". National Biodiversity Network. Retrieved 25 April 2016. ^ "Gift Aid". RSPB. Archived from the original on 22 February 2007. Retrieved 19 February 2007. ^ Dellingpole, James (7 April 2013). "RSPB makes a killing... from windfarm giants behind turbines accused of destroying rare birds". Daily Mail. Retrieved 23 December 2013. ^ Iles, Harry. "RSPB - 207076" (PDF). Charity Commission. Retrieved 15 May 2016. ^ Jamieson, Alastair (3 October 2009). "Springwatch star Kate Humble appointed president of RSPB". The Telegraph. www.telegraph.co.uk. Retrieved 4 October 2009. ^ Hogg, Gemma (12 October 2013). "Miranda Krestovnikoff becomes RSPB President" (Press release). RSPB. ^ "Wildlife and Countryside Link, Our members". Wcl.org.uk. Retrieved 31 January 2014. ^ "RSPB, Our partnership with BirdLife International". Rspb.org.uk. Retrieved 31 January 2014. Adams, William Mark (2004). Against Extinction: The Story of Conservation. London Sterling, VA: Earthscan. ISBN 978-1-84407-055-8. Boardman, Robert (2006). The International Politics of Bird Conservation: Biodiversity, Regionalism And Global Governance. Cheltenham, UK Northampton, MA: Edward Elgar Publishing. ISBN 978-1-84542-403-9. Penna, Anthony N. (1999). Nature's Bounty: Historical and Modern Environmental Perspectives. Armonk, N.Y. U.S.A.: M. E. Sharpe. ISBN 978-0-7656-0187-2. Charity Commission. Royal Society for the Protection of Birds, registered charity no. 207076. "Royal Society for the Protection of Birds, Registered Charity no. SC037654". Office of the Scottish Charity Regulator.